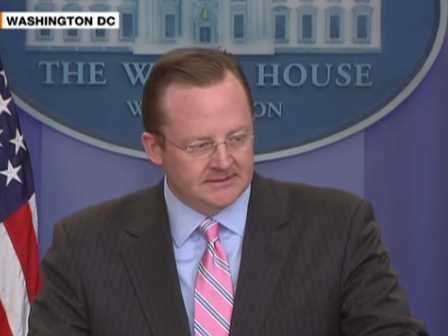 On Sunday’s “Up w/Chris Hayes” on MSNBC, former White House press secretary Robert Gibbs revealed the Obama White House’s early public-relations strategy on the drone program: avoid it if at all possible. “I think you’ve seen recently the president discuss the need and desire to be more forthcoming,” Gibbs said. “I certainly think there are aspects of that program that are and will remain highly sensitive and very secret, but let me give you an example here, Chris. “When I went through the process of becoming press secretary, one of the first things they told me was you’re not even to acknowledge the drone program. You’re not even to discuss that it exists. “But here’s what’s inherently crazy about that proposition: You’re being asked a question based on reporting of a program that’s secret,” Gibbs continued. “… Pay no attention to the man behind the curtain. I think in many ways, and I think what the president has seen — and I have not talked to him about this, I want to be careful. According to Gibbs, Comedy Central’s “The Daily Show” host Jon Stewart elicited the clearest answer yet from the president on the drone program.